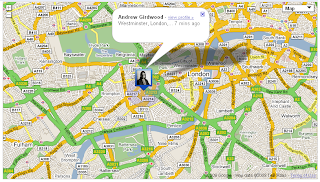 I visited Google London today and left Google Latitude running on my BlackBerry. Visitors are not allowed to take pictures but Google Latitude doesn't break any rules. While I was there theweirdone kindly took a screen grab of my location. As you can plainly see rumours that a skull and cross bones appear on screen before blowing up your computer if you try and use Latitude inside a Google building are entirely false! Sadly, I've not been able to prove that Google are not hiding space alien pirates in their London HQ. I will continue that investigation.